Transform your offsite backup and recovery process with Replacador! Replacador ensures your backups are accessible online. Our appliance streamlines disaster recovery, which means you can now respond to any data loss event without getting up from your seat. No mad scramble for the right tapes to restore during a recovery process. In fact, you won’t even have to pick up a phone, just point and click. Replacador economizes on throughput for offsite backups. Users see at least 10 to 1 deduplication ratios for incremental backups and upwards of 100 to 1 for full backups. Replacador boasts a list price of $4,000, making it the most budget-friendly deduplication appliance on the market. Replacador’s simplified pricing scheme maximizes your ROI by avoiding hidden fees and surcharges. Deduplication is important because it allows you to store up to 50 full backups in the area normally required for two or three backups. Deduplication is great for backups because you get very high deduplication ratios, and you can replicate the backup by sending only the changes across the network or Internet. This gives you a way to maintain a secure backup of your data in the event of a disaster. Windows Server 2012, and later, includes free deduplication that works very well for backup files. 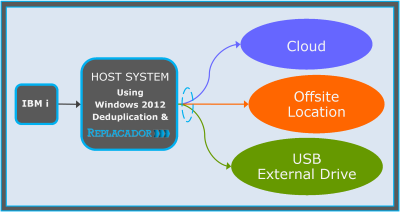 Replacador makes Windows Deduplication a complete solution by adding the replication function. includes FREE deduplication and Replacador provides the replication function for the Windows deduplicated volumes. Using Replacador with Windows Deduplication gives you the benefits of dedupe with replication without the high price of a single purpose deduplication appliance. Now the process of creating duplicated and replicated copies of your backups while saving storage space is more affordable. With Replacador, you can automatically replicate your deduped data to the cloud, offsite location, or external drive. This provides maximum protection of your data and assurance that it will be available in the case of a disaster. With the ever-lowering price of external drives, it is easy to add a second or third local or remote copy of your entire backup set. Now you can experience the benefits of deduplication with replication at a much lower cost than ever before. Replacador makes it possible to use a standard Windows Server as a deduplication appliance, without the inflated price of most dedicated dedupe appliances. Why rely on tape for your backup/DR solution? Trying to manage and maintain a full disaster recovery plan using physical tape is time-consuming, labor-intensive, and prone to human error. Tapes can be mislabeled, misplaced, lost, stolen, or fail when critical data needs to be restored. As backup volumes continue to increase, deduplication and replication offer a solution you should consider. UBD with Replacador makes that solution far more affordable than ever before. Replace the time-consuming, labor-intensive aspects of tape with a complete no hassle backup solution using Windows Deduplication and our Replacador with UBD, the Universal Backup Device for Windows, Linux, and IBM i. Replacador can also be used with LaserVault Backup, our TCP/IP backup solution for IBM i. To learn more about Replacador, download the Replacador Executive Overview. For a more in-depth view, sign-up to see an on-line demo today. It’s quick and easy.